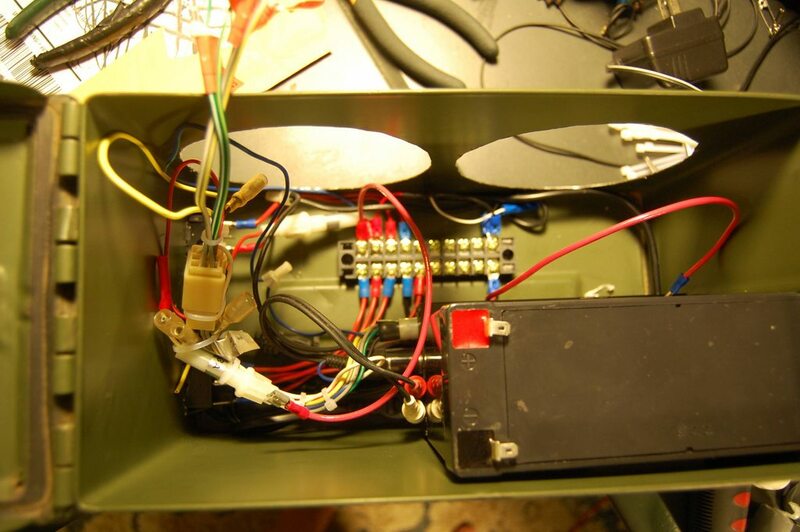 Better be very careful or the bomb squad will freak out and mistake it for a IED and blow you portable amp to bits. No, I walk around with these things whenever I go to a range. And Mike Szczys is wrong, it never was intended to contain high explosive, it just contained either 100 rounds of 50 BMG or 800 rounds of 5.56 NATO. my suggestion would be a bluetooth reciever, that way the box can be left anywhere and your valuable phone stays in your pocket, and also the phone doubles as a “remote controll”. you can get wee bluetooth recievers that would normally connect to headphones on ebay for a small fee. The downside is that if it is sealed like that, the can might make some noise. I know I can hear the side walls of my ammo cans pop in and out when the air pressure changes enough, because it is air tight. Try ammo tin on ebay. I had a look the last time an ammo tin hack came up. There were quite a few. Also if you have an army surplus shop they might have some (the one near me used to stock them. Final one is a guess, but a sporting goods store may have them too. On a related note, I can honestly say that reading Hackaday got me my current job here: http://www.curiousprovisions.com I spend all day making boomboxes in vintage suitcases. Eek! Naked speakers, my eyes are offended. What the sun don’t damage careless handling will on the timed life rims of the external mounted speakers. Dirt will get into the voice coil gap and bring on a grinding sound. Coaxial speakers have this unsealed problem that single drivers don’t have, plus the shadowing of the midrange of the main speaker by the tweeter. I have a 50 cal case, I will keep it as a waterproof case. 1: Sound quality – You can improve it greatly by dividing the chambers of the speakers. Other wise you get phase canceling, among other problems. 2: Cooling – This is a 2 fold win on this. First off, you need not worry about weather sealing in the can, with all the holes you put in it. So, lets add some ports for the speakers! It’ll improve audio response, and provide air movement to cool the components! Kinda sorta like i made back when i was in the National Guard, but mine was an old car stereo+ 2 speakers+ magnetic mount antenna ( flexible PR77 antenna adapted to it ) and a PR77 battery (14v but drops to 12v when it gets old) and it all fit inside nice and snug. whats the point of using a waterproof box, when you cut holes in it? the gansta look? Built something similar some years ago, i placed the speakers and all connectors under the lid. Just slide the lid to the side, and you can take it off. Lead battery, included charger (supplied by a 16V/7.5A IBM power supply). Unfortunately I have no inner pictures, but there’s a lid on the electronics with a compartment for your player/phone and the volume potentiometer and the power switch. I like the ammo box. check out this topic http://gathering.tweakers.net/forum/list_messages/1516964 it’s in dutch but it has so mutch information.